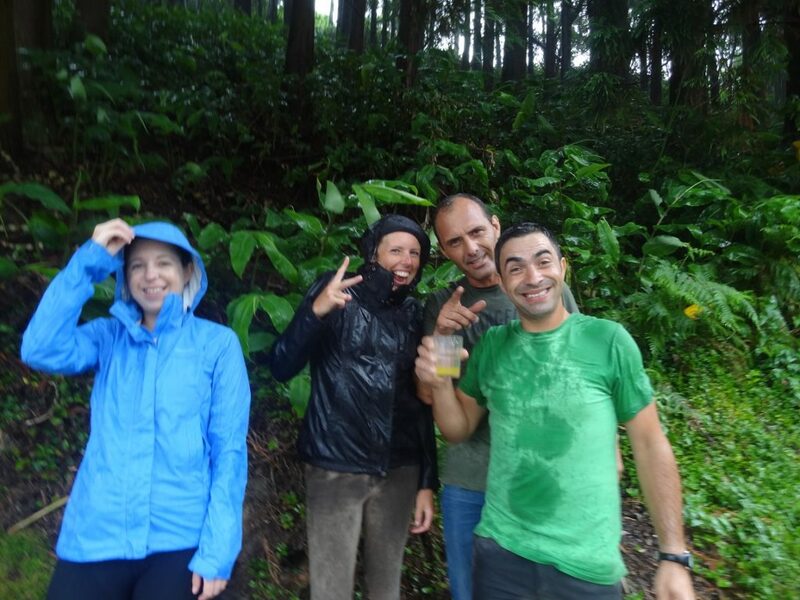 In July 2015 I visited the Azores to experience our popular Green Island Trail. Here is the blog about my trip. After a long drive I arrived at Gatwick Airport, I found my check-in desk tucked away round a corner. I was flying with Sata Airlines, the airlines of the Azores. The airline is only small and it felt strange to only have one check-in desk with only a few people queuing up (mainly on organised rambling holidays). My flight was delayed by an hour (I later found out this is very common!). My destination was Ponta Delgada on Sao Miguel Island. My first glimpses of the island were amazing; we fly around the island and then landed what looked like right next to the sea. I couldn’t believe how mountainous and green it was. Rudi met me in the small arrivals hall of the airport and we drove the short journey of 20 minutes to Quinta da Terca. Usually Rudi takes guests through Ponta Delgada, however the town was closed off due to a festival. 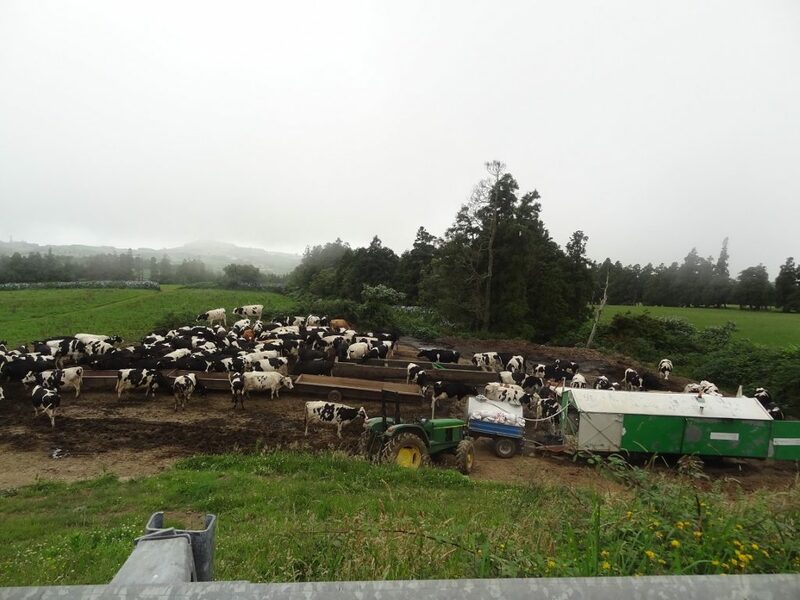 In the 20 minute drive I had already learnt lots of facts of the island; there are two big milk factories including a Nestle factory on Sao Miguel, there’s 4000 horses and 8000 cows. I can quite believe there were that many cows as everywhere you look there was a cow!! 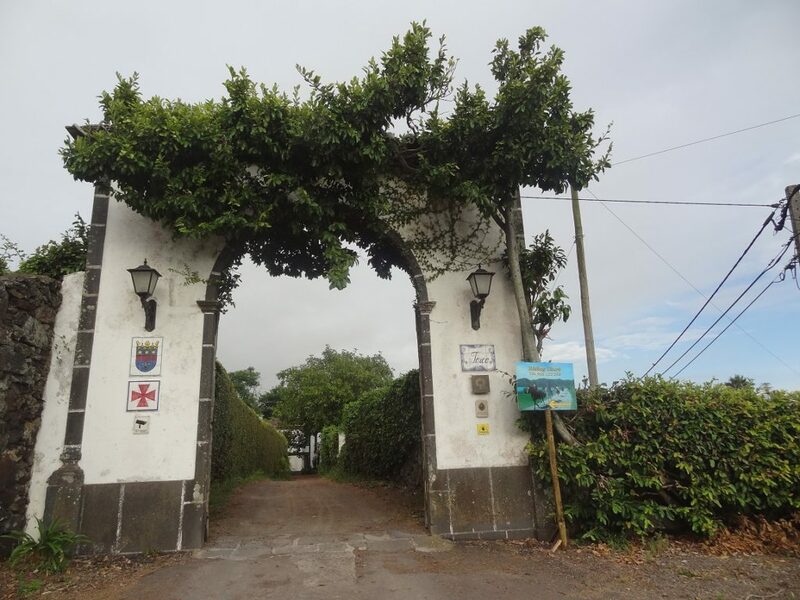 As we drove up through the archway entrance to Quinta da Terca I felt so excited, the quita looked so old and quaint. I was greeted by Christina and Claude’s friendly faces and there two dogs who do a very good job of meeting and greeting. Christina has a constant happy smile and is lovely and friendly she made me feel instantly at home. 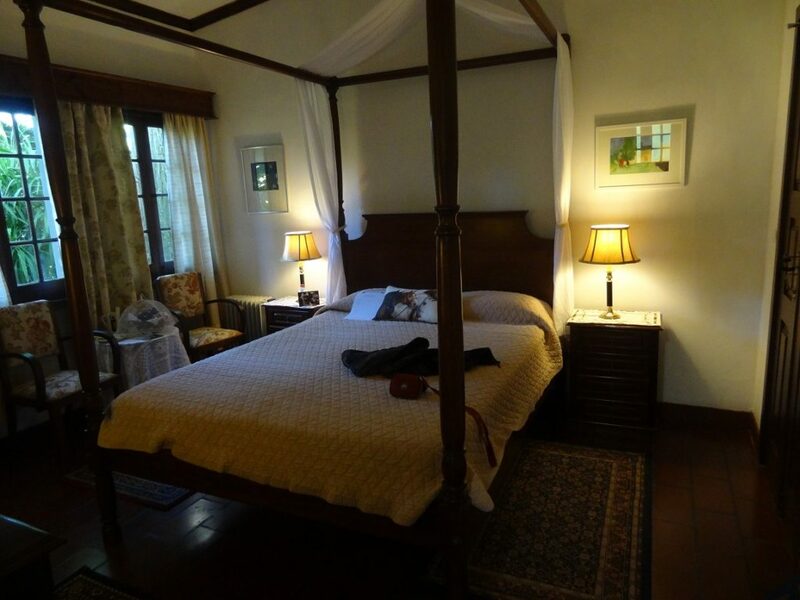 Christina showed me to my room which had a four-poster bed in it, fruit bowl, and bar of chocolate and bottle of wine AMAZING. 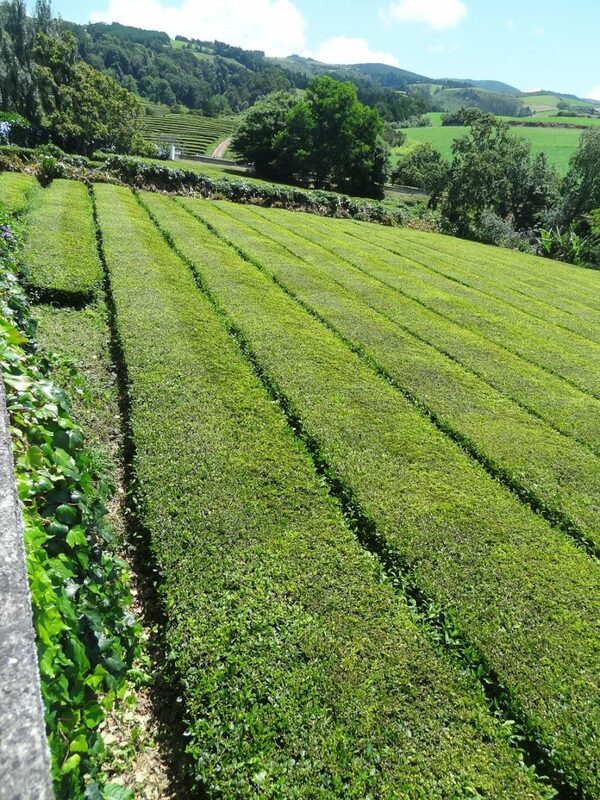 The wonderful factor of this holiday is there is an itinerary for all abilities. I was doing the Green Island Itinerary which involves 24 hours of riding over a 7 night stay and a few non-riding activities. If you did not want so much riding then you can opt for the Atlantis Trail which includes 17 hours of riding and more non-riding activities. For the novice or nervous riders there is the Learn to Ride itinerary. This is a wonderful opportunity if you want to gain more horse knowledge, learn to brush and tack up your horse and how to read the characteristics of your horse when you are riding him/her or when they are loose and integrating with the herd. The aim by the end of the week is you’d be able to join the full day ride around Sete-Cedades. 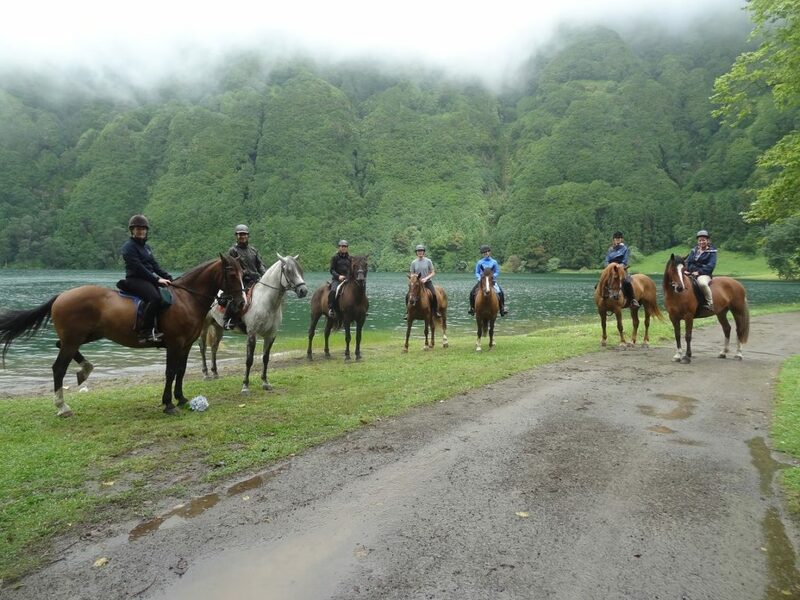 Each day the horses are trucked to a different part of the island so you are never riding over the same land twice. The riding on the green island is a mixture of pace but they do like to kick on where possible. Each day’s views never failed to disappoint you’d find yourself standing what felt like on top of the world with views overlooking the island. 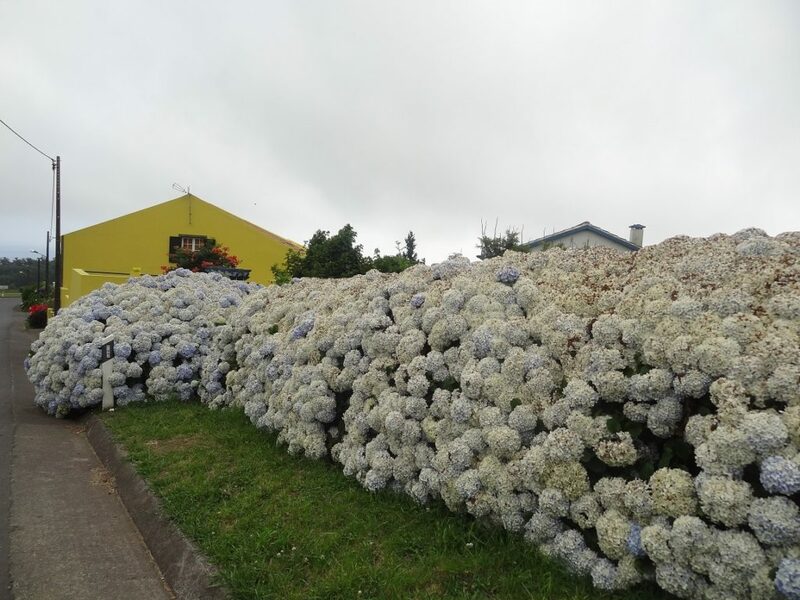 I went In July and the hydrangea plants were in full bloom, whole hedgerows full of colour. The island is very traditional with farming being the main income. Grass grows so fast here they take six cuts of hay a year. You will come across farmers milking their cows in the fields while the farm dogs guard the milk. In the towns the men sit outside the bars having a drink discussing their busy mornings, while the women go about their daily choirs. 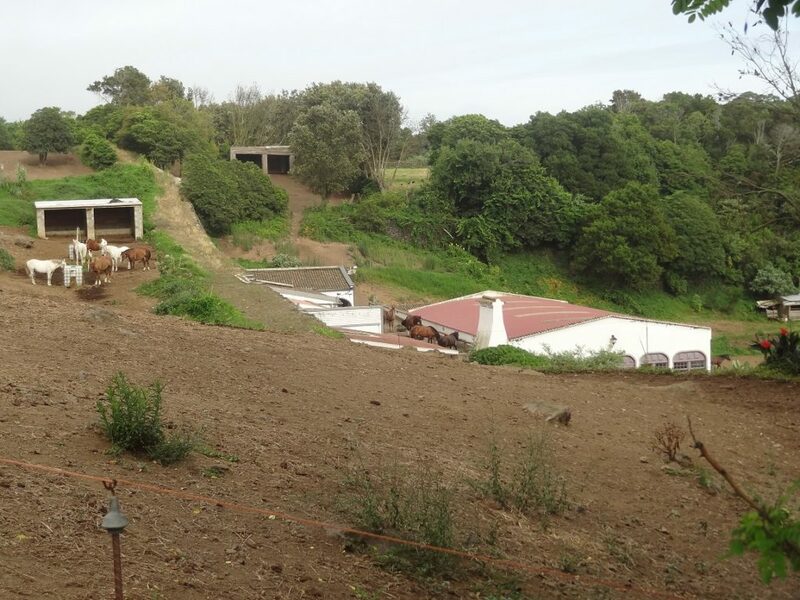 The horses at Quinta da Terca are all rescued by Christina off the Island. There is a huge array of types, sizes, colours and temperaments. One thing that is so apparent is how happy the horses are. Christina says once they arrive at Quinta da Terca this is their home for life and I think the horses know this. They are all so happy and content. A lovely touch is an album which Christina has produced which is the story behind every horse’s life and how they came to her. You cannot wait each evening to have a read about the horse you have ridden that day. Considering most of the horses have not had a good start in life these horses are so forgiving. When we were not riding we were exploring the island. Throughout my week we went to two thermal spa’s, the only tea plantation in Europe and visited an amazing lake called Lagoa de Fogo up on Fire Mountain with the most breath-taking views of the North and South Coast. I also opted to go Whale Watching one morning. I had never seen a dolphin or whale before, the viewing cannot be guaranteed but I crossed my fingers I’d see them. We set off on our boat and with our guide and skipper constantly on the phone and radio commuting with people on lookout. Its so nice to think that years ago the Azores was one of the biggest places for whale poaching and now they are so treasured. We finally came across a whole pod of Sperm Whale which also had young. Once we found the whales the dolphins seemed to appear. I thought they were all so mesmerizing. 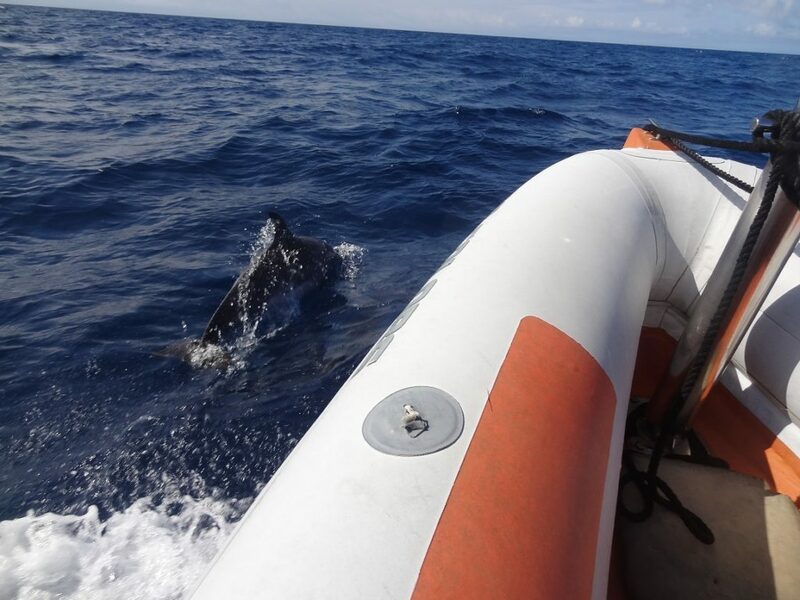 Our skipper turned the boat engine off and we sat all in silence with open mouths viewing these huge graceful creatures whilst the dolphin played around and under our boat. One point I have to mention, which is as much a highlight as the riding was the food on this holiday. You certainly will not go hungry!! Even for the fussy eaters (like me) there is so much adorable food. 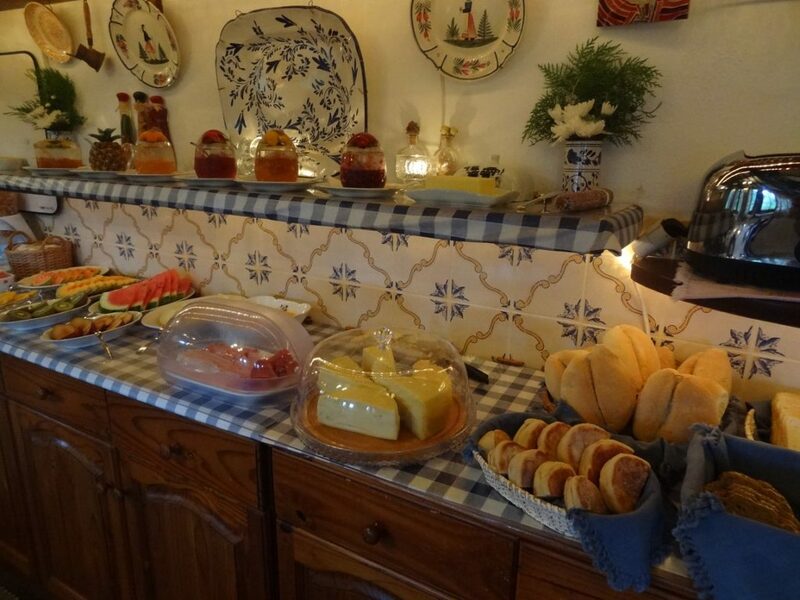 For breakfast there is a huge array of meat, fresh fruits (mostly hand-picked by Christina) or local off the island, cheeses, breads, jams etc. Venetia prepares the most amazing lunches even the picnics you would not believe the amount of food and attention to detail that was given. Evening meals Christina cooked herself (she is like super women; I don’t know how she fits everything into her day). The meal in the evening was always three courses of which by the end you have to sit there for the next hour as you are too full to move. 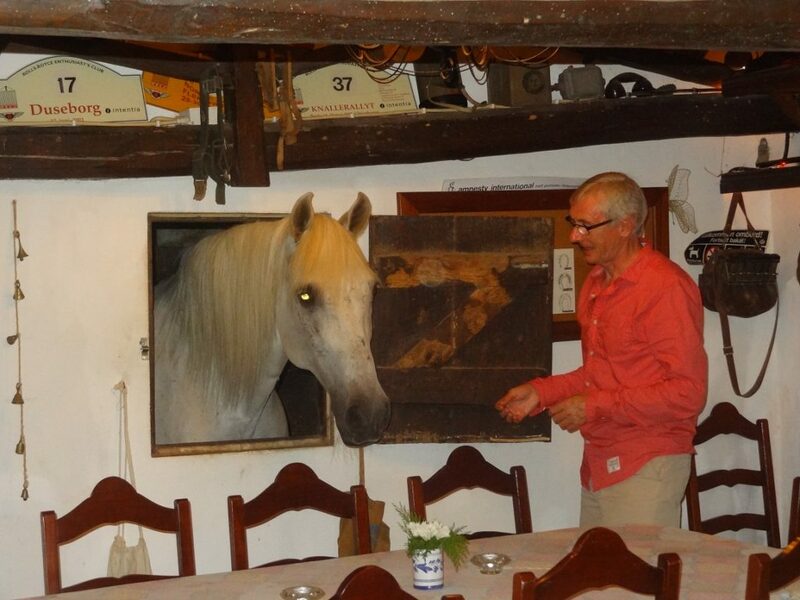 The highlight of every evening was Claude bringing either bread or carrots for us to feed his beloved grey horse which joins you for dinner, you can’t ignore him otherwise he rings the bell!! The Azores has a mild temperate climate with average temperatures ranging from 14ºC to 22ºC. During the summer months it can become very humid. However the weather is changeable and it is not uncommon to experience four seasons in one day. At the beginning of my week I was applying sun screen and trying not to get sunburnt, by the end of the week I was emptying the rain water out of my boots!! This island is going to stick in my mind for such a long time. I have never been to such a colourful, vibrant, volcanic, friendly (my list is endless!) place before. I was sad to leave Christina and her team of guides, horses and dogs. Certainly well worth the visit. Thank you Hannah Moss for your lovely description of your holiday. 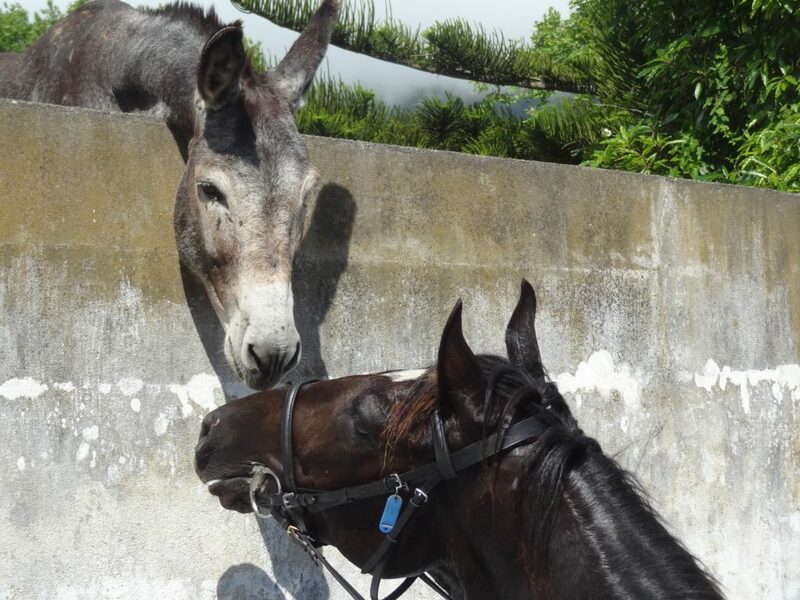 This year will be my sixth visit to Quinta and I am looking forward to meeting up with both 2 and 4 legged friends.